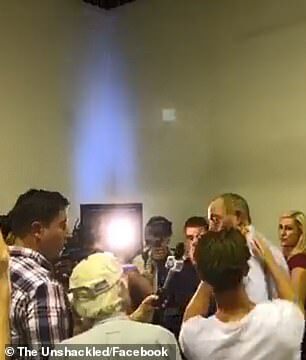 Senator Fraser Anning took a swipe at a left-wing activist at a protest rally after the 17-year-old cracked an egg on his head. The confrontation on Saturday came as a petition to get Anning removed from office garnered 225,000 signatures. 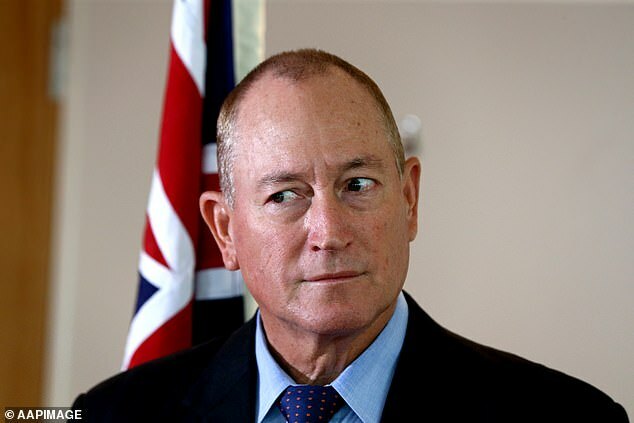 Mr Anning released a statement on Friday, claiming the growing fear of the ‘increasing Muslim presence’ was behind the New Zealand terror attack – which left 49 worshippers dead. 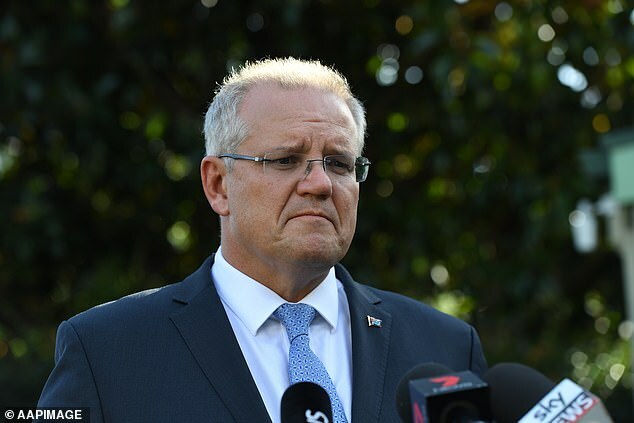 The right-wing politician has been slammed by his peers for his extremist stance, while other Australians paid their respects to the victims of terrorist attack. 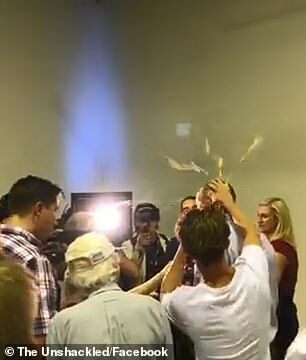 Mr Anning was speaking at a Conservative National Party Meeting in Moorabbin, Melbourne, on Saturday afternoon when a young man approached him with the egg. Video footage from the event shows the young man approach Mr Anning from behind, as he speaks in front of a camera. 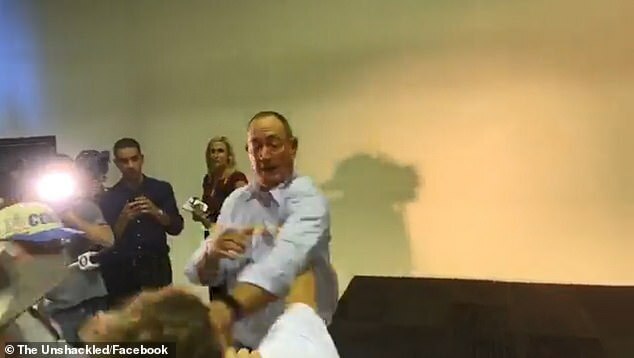 The man, who films the altercation, then slams an egg on to the back of the Senator’s head who spins his body and takes a swipe at the youngster. 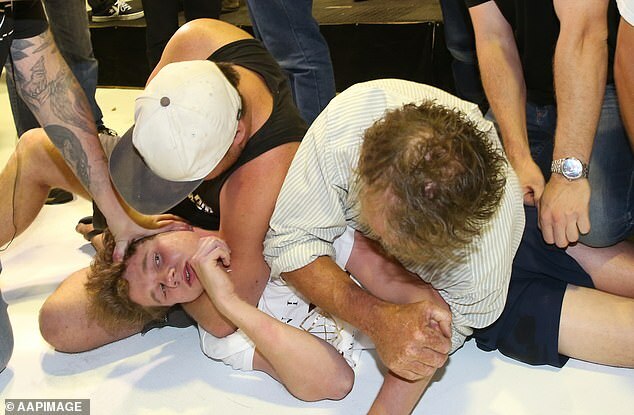 A short scuffle ensued before the man was tackled to the ground by other members of the public. An image from the event shows the man walked from the venue by police. 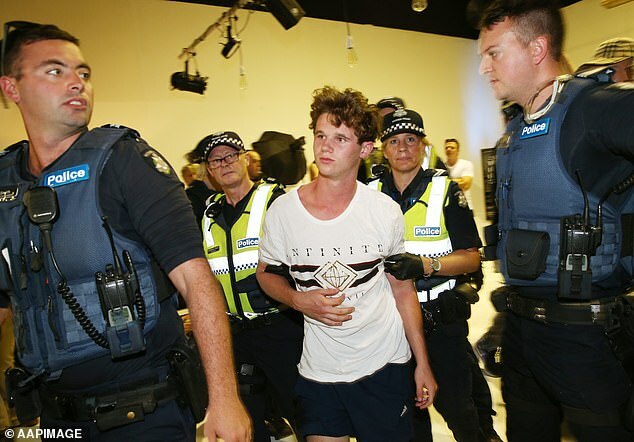 The 17-year-old was arrested after he allegedly egged Senator Anning but has since been released pending further enquiries. 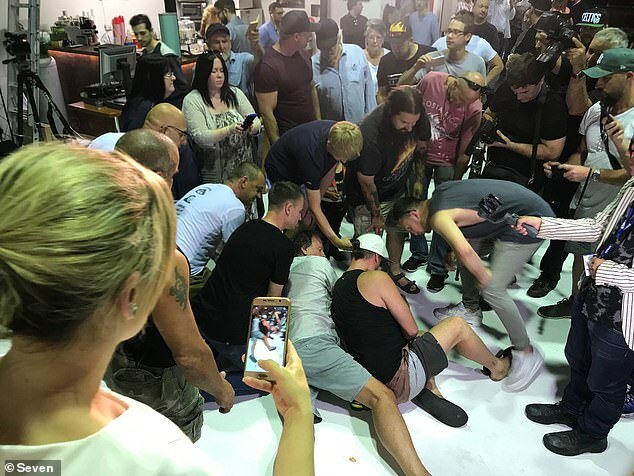 A video has emerged of men believed to be right-wing cronies filming themselves apparently choking the man who threw the egg. The footage films the man’s face up-close as he’s appeared to be held down by the neck. The men can then be heard hurling abuse at him. ‘You are nothing but a weak human being you p****,’ one man can be heard saying. While another concerned member of the group appears to tell his friends to ‘let him go’. 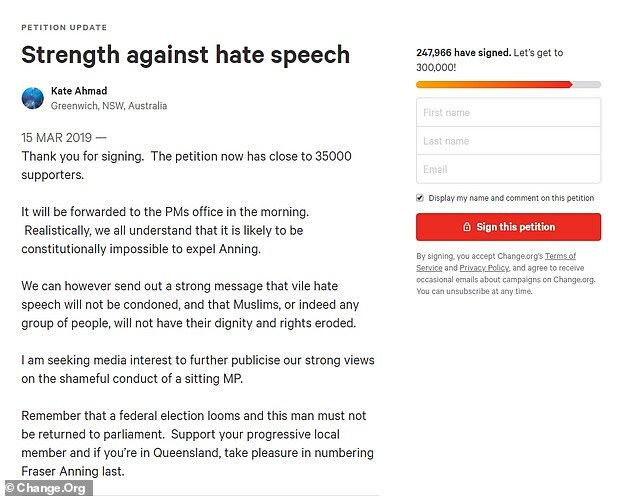 ‘We call on the Australian government to expel this man who blames victims for their own violent deaths, and uses references to genocide to further his hateful agenda,’ the petition says. 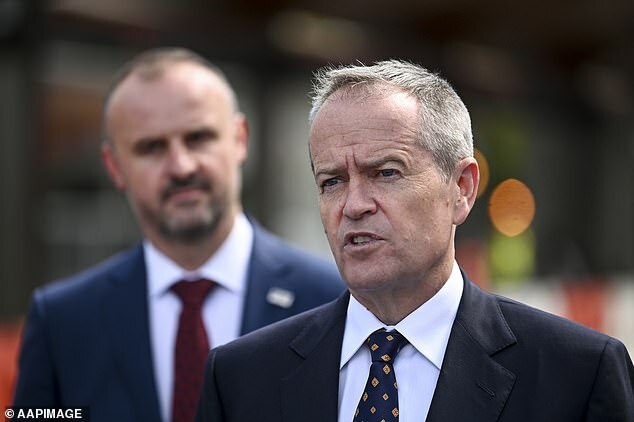 Opposition leader Bill Shorten also voiced his anger at Anning’s comments. ‘While families in Christchurch mourn for loved ones they’ve lost, an obscure Australian senator saw this act of terrorism and tragedy as an opportunity to blame the murder victims,’ he tweeted. Mehreen Faruqi, the first Muslim woman elected to federal parliament, named Senator Anning and Pauline Hanson as politicians who target Muslims. ‘There is blood on the hands of politicians who incite hate. To me, there is a clear link between their politics of hate and this sickening, senseless violence in Christchurch,’ she tweeted. Senator Anning, who was kicked out of the Katter’s Australian Party, sparked a deluge of negative reactions on Friday, with people immediately condemning him on social media. ‘White supremacy (your ideology) killed these people. Shut the f*** up and have some respect,’ one person wrote on Twitter. ‘Resign. You do not deserve to stand representative of the Australian people,’ another person said. A third person added: ‘You are an embarrassment to humanity’. In a follow-up statement, Senator Anning said he opposed to any form of violence within our community and totally condemned the actions of the gunman. ‘What it highlights is the growing fear within our community, both in Australia and New Zealand, of the increasing Muslim presence,’ he said. 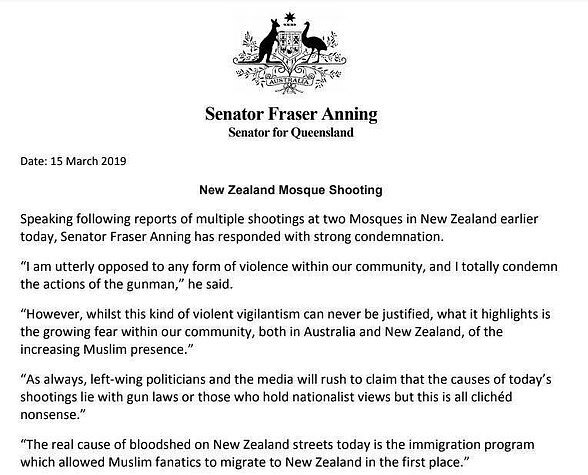 Senator Fraser Anning’s shocking comments came after news of the multiple shootings at two mosques in New Zealand first broke earlier on Friday morning. 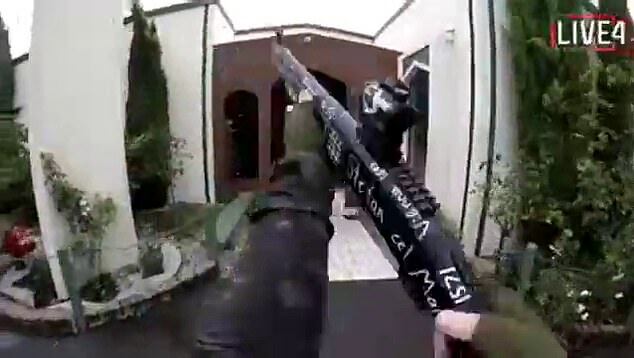 A 28-year-old Australian white supremacist opened fire at Al Noor Mosque in Christchurch on the country’s South Island about 1.30pm (11.30am AEDT) on Friday. The gunman, Brenton Tarrant from Grafton in northern New South Wales, live-streamed the mass shooting. Senator Fraser Anning described as ‘cliched nonsense’ the idea that nationalist ideology was to blame. 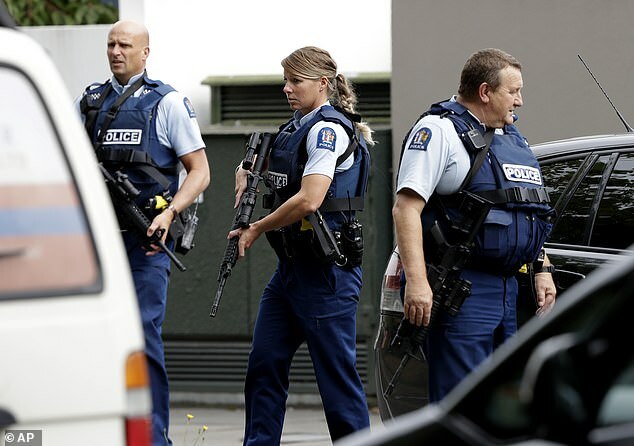 ‘The real cause of bloodshed on New Zealand streets today is the immigration program which allowed Muslim fanatics to migrate to New Zealand in the first place,’ he said. Senator Fraser Anning said while Muslims were the victims in this instance, they were usually the perpetrators. ‘Worldwide, Muslims are killing people in the name of their faith on an industrial scale,’ he said. The senator said Islam was not like any other faith and quoted the Bible to justify his assertion. ‘It is the religious equivalent of fascism. And just because the followers of this savage belief were not the killers in this instance, does not make them blameless,’ he said. 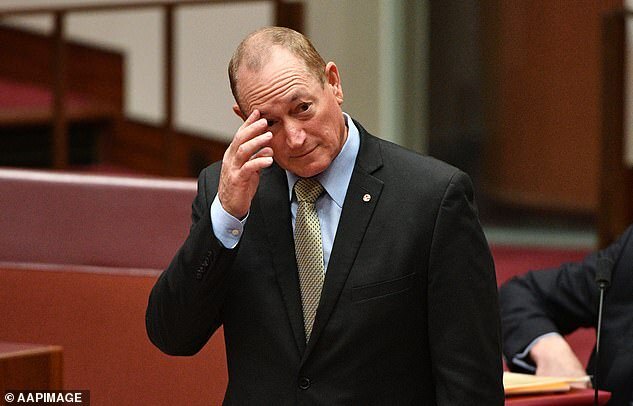 In August, Senator Anning told Parliament a ‘final solution’ to Muslim immigration was needed in the form of a plebiscite, several months after defecting from Pauline Hanson’s One Nation party.